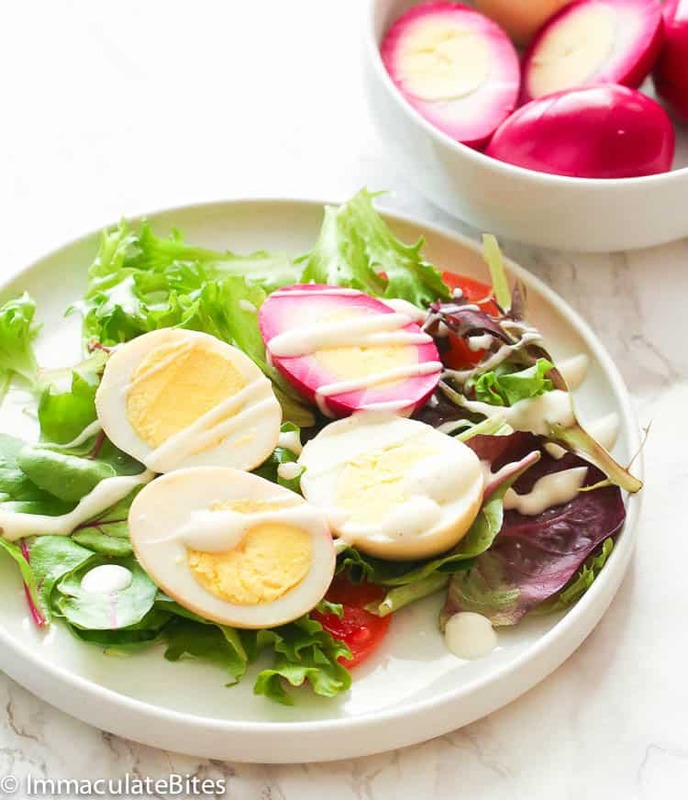 Pickled Eggs – elevate your usual hard boiled eggs into this all-natural beet pickled eggs. 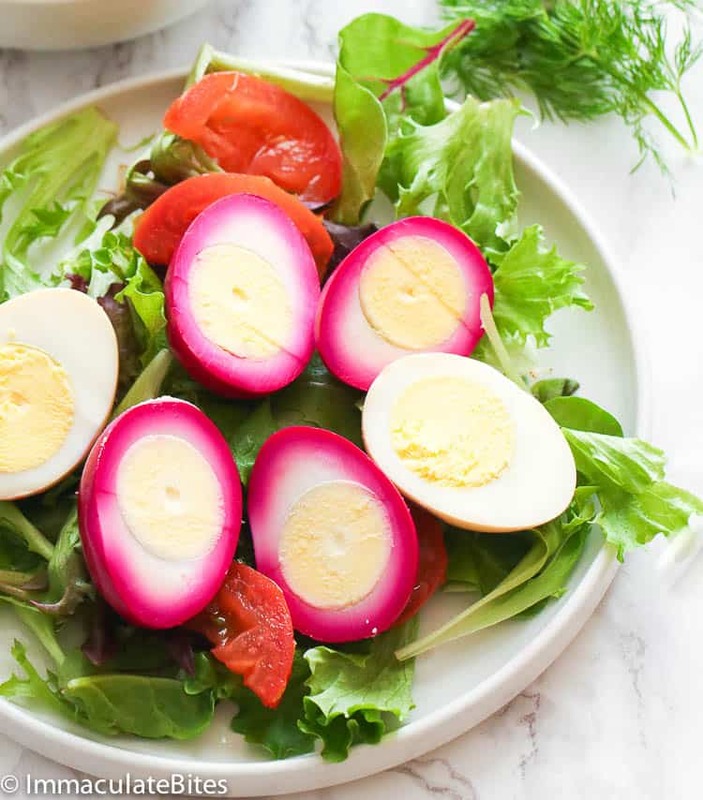 Makes a lovely egg presentation on Easter or a great pop of color to your favorite salad. Sweet, sour and spicy! For Christians like me, Easter Sunday is a big thing for us. I’ve grown up to Easter traditions passed on from generation to generation. 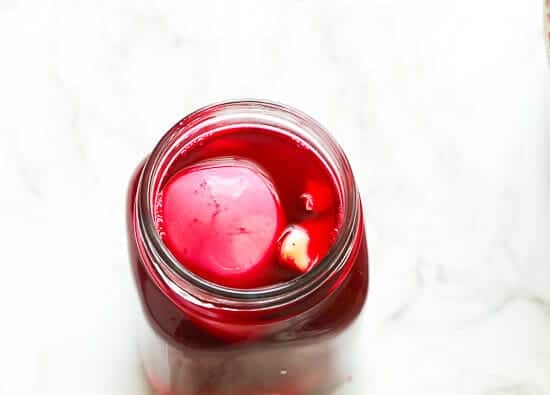 This time, I’m adding my own version in this easy beet Pickled Eggs. It makes a great presentation on Easter, a lovely pop to your usual salads and a yummier egg sandwich filling. And this comes ready in no time! 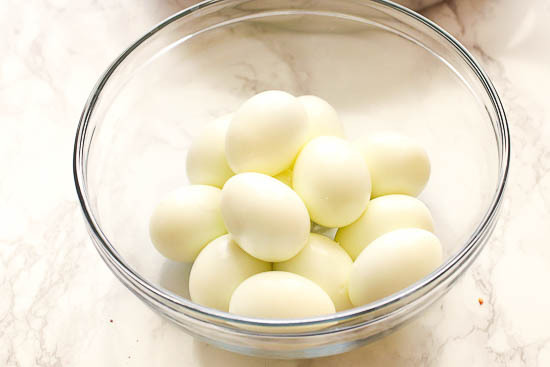 Pickled Eggs are typically hard boiled eggs soaked in a vinegar-based solution for days or months. It is a method in preserving or prolonging the life of a food so it can be enjoyed months later. Pickled eggs are usually served as a snack or as an appetizer/starter mostly in pubs, bars; anywhere where beer is served. There are a couple of variety to this recipe. The final taste of an egg would largely reflect on the pickling solution used for it. The longer they are soaked, the more prominent the flavors become. Which Vinegar Is Best For Pickling? Vinegar has been used for centuries in preserving the shelf life of a food. I won’t go into a “science-cy” detail, but the acidity of vinegar inhibits the growth of bacteria, thus making any food stored in vinegar could last much longer even without refrigeration. Cider Vinegar. Perhaps the most popular kind of vinegar these days. 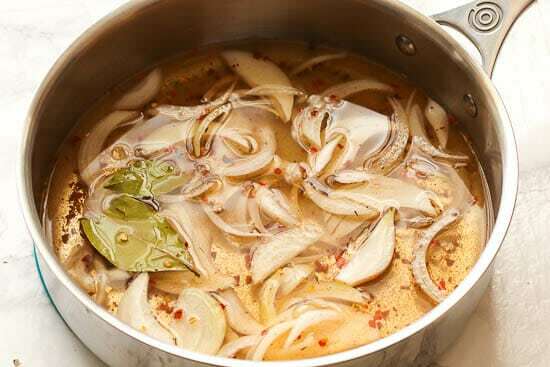 Cider Vinegar is a moderate colored vinegar with a fairly distinct flavor. Wine Vinegar. You do need to double check the labels if it’s over 5%. Wine vinegar are usually delicately flavored especially when compared to that of cider vinegar. Malt Vinegar. Made from malted barley, this type of vinegar is often quite dark brown with fairly bold flavor. It’s particular color makes the pickled food obtain a shade brown. For pickling high-flavored produce, you must go with this one. Well, for me, Pickled Eggs are best enjoyed within its first two weeks of pickling or until enough to pick up the flavors from the solution. For small eggs, it would usually take 1-2 weeks while the medium or large ones,would take 2-4 weeks. But they usually last for about 3-4 months when refrigerated. Do Pickled Eggs Need To Be Refrigerated? Yes, pickled eggs highly needed to be refrigerated at all times. Storing them at room temperature will cause botulism – a rare and potentially fatal illness caused by a toxin from a bacteria. Furthermore, please take note that when serving Pickled Eggs, it should never be at room temperature for more than 2 hours. 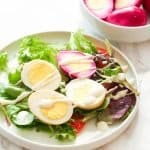 These sweet, sour and spicy Pickled Eggs are perfect add-ons to your green salads or as a yummier filling to your Egg Salad Sandwich. 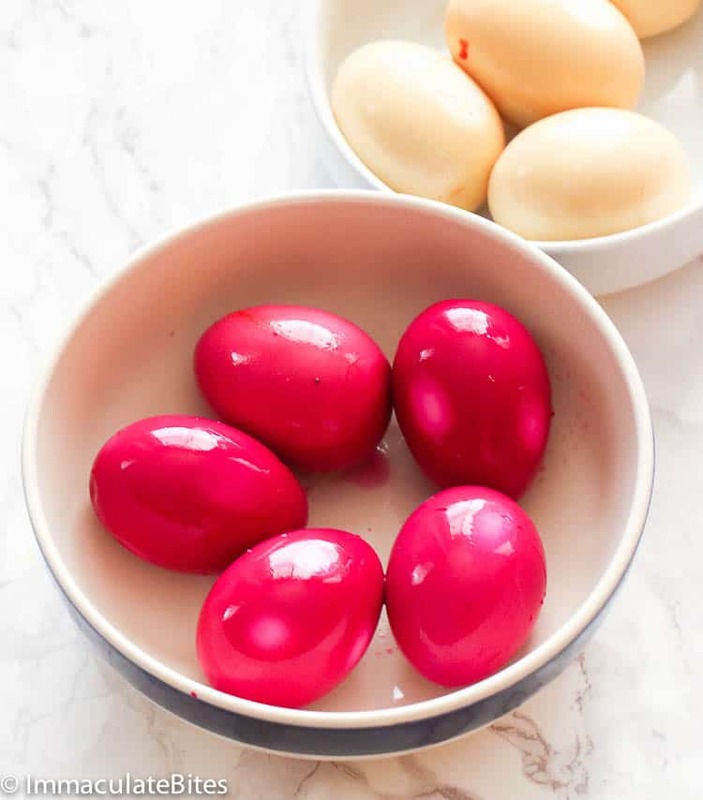 For a colorful egg presentation this coming Easter, you can make other all-natural pickled eggs with various colors using any of these methods HERE. 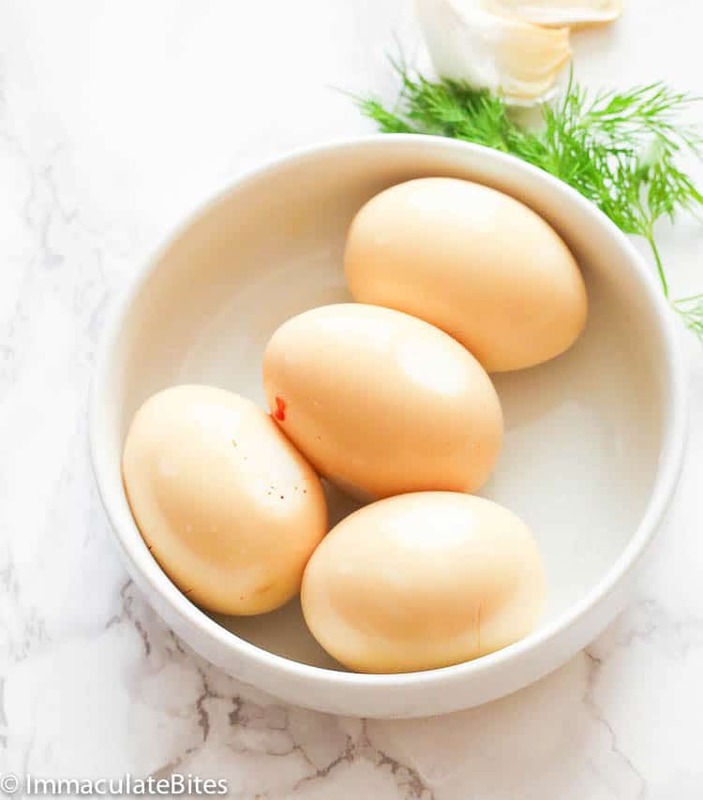 When pickled egg is stored in the refrigerator, give the jar a gentle shake to redistribute the spices every couple of days for at least 2 weeks and up to a month. 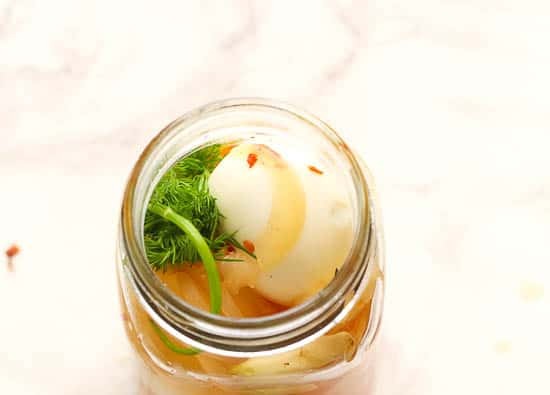 When removed from the pickling liquid, the eggs can stay in an airtight container, in the refrigerator for up to 3 days. If you want a marbled look on your eggs, you can lightly crack its shells before soaking them in the beet mixture for 2 hours. This makes a great presentation on your Easter dining table. Check this guide for a perfectly cooked hard boiled egg. 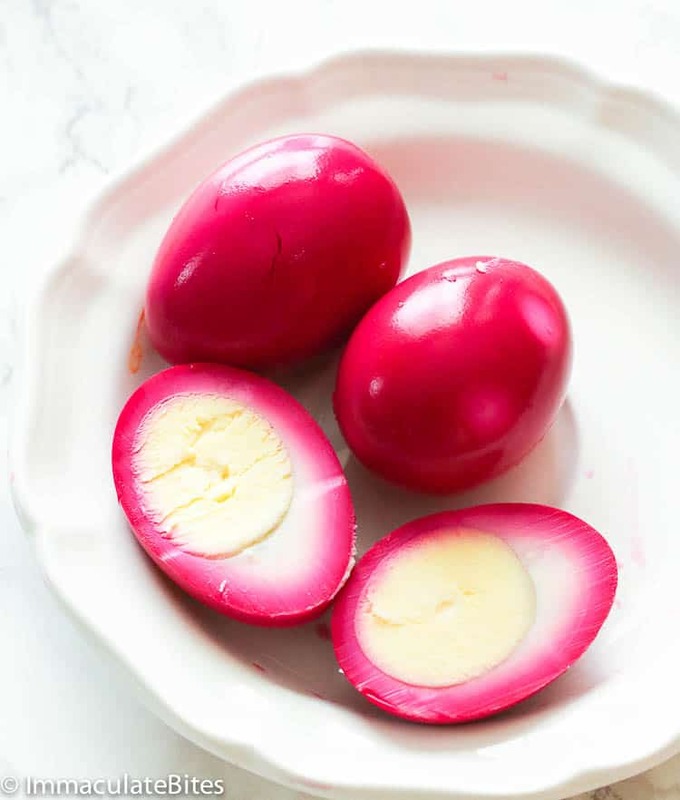 Pickled Eggs - elevate your usual hard boiled eggs into this all-natural beet pickled eggs. Makes a lovely egg presentation on Easter or a great pop of color to your favorite salad. Sweet, sour and spicy! Peel the eggs and place in the bottom of a clean, quart-sized glass jar or 4 cup container. 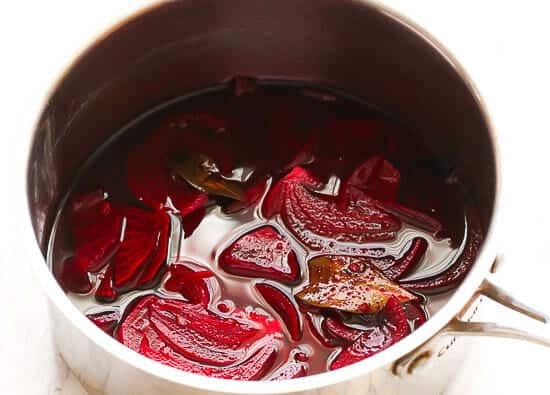 In a medium saucepan, add the vinegar, water, onion, dill, garlic, creole seasoning, pepper flakes, bay leaf, sugar, and beets if using any. Beets are optional; only use if you would like to give it some color. Bring to a boil over medium high heat and cook uncovered, until the sugar has dissolved and the onions are translucent, about 3 to 5 minutes. Remove from heat and let cool a few minutes. Pour the pickling liquid over the eggs in the jar making sure to cover the eggs completely. Spoon the onions on the top, this helps to hold the eggs under the liquid. Cover the jar and refrigerate for about 24 hours or up to a month. The longer the eggs sit in the pickling juice, the more the pickling juice will penetrate the eggs. 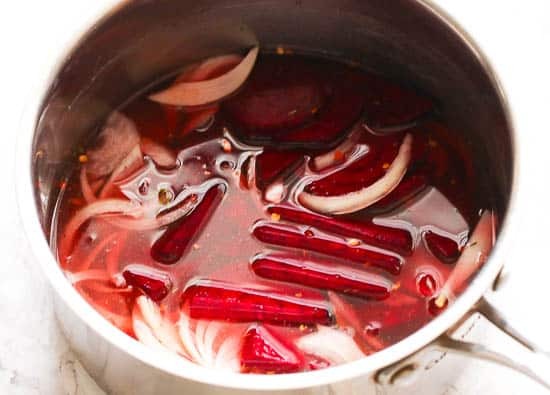 In a medium saucepan, add the vinegar, water, onion, dill, garlic, creole seasoning, pepper flakes, bay leaf, sugar, and beets if using any. Beets are optional , only use if you would like to give it some color. Pour the pickling liquid over the eggs in the jar making sure to cover the eggs completely. Spoon the onions on the top, this helps to hold the eggs under the liquid. I forgot to add the garlic cloves and just got them k to the jar and covered with liquid and onions. Should I pop some raw cloves into the jar or will they still be good without garlic? Hi, Beverly. 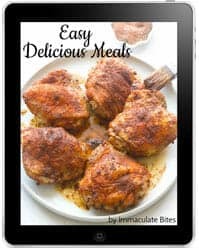 I can’t give you an accurate answer to that since I haven’t tried this recipe without using sugar. Great tip Chris ! Thanks for sharing . Yum, I love fennel. Will try ! I’ve never made these, but I have tried them store bought a few times. I love the flavor but the ones I’ve tried have a tough, rubbery texture. Does the pickling cause that texture or we’re the ones I had just old?